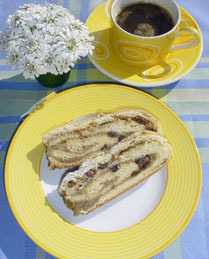 Orehnjaca is a popular Croatian strudel filled with walnuts. It can be bought in every bakary, but homemade is the most delicious. This recipe is work intensive but the result is so satisfying. Preheat oven to 200 degrees C (390 F). Grease a 30cm X 20cm (11 x 8-inch) baking tray with cooking oil. Mix flour, sugar and crumbled fresh yeast. Add warm milk to make sour dough. Leave it in warm place to double in volume. Place flour into warmed large bowl. Make a hole in center. Lightly beat egg yolks and the one whole egg with milk and sugar. Add eggs, melted butter, lemon zest, sour cream, rum and sour dough. Using electric mixer beat dough until soft bubbles appear. Dust dough with flour and cover with towel. Leave it to double in volume. Mix ground walnuts with steaming milk. Add raisins, lemon zest, cinnamon, vanilla-sugar and honey and mix well. Divide dough in two equal parts. Roll each part in rectangles 25cm x 18cm. Put filling mixture alongside each rectangle and roll it into strudel. Put the strudels in baking tray and leave to rise about 15 minutes. Bake in preheated oven for 45-50 minutes. Leave it to cool and dust with sugar. Cut in 15-20 pieces. Thank you, this was very good.